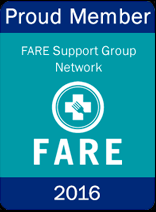 Nationwide online support group; some access is free, but if you pay for yearly membership ($25) you have access to all the discussions on their forums as well as their extensive allergy recipe database. Helpful list of further resources; thanks Charlotte! www.kidsareworthit.com: Barbara Coloroso’s site offers downloadable handouts for parents. www.education.com/topic/school-bullying-teasing: A range of articles provide multiple perspectives on bullying. www.prevnet.ca: This research site includes info sheets and perspectives on both victims and perpetrators. www.whyriskit.ca: A youth-focused site from Anaphylaxis Canada, including true stories of bullying incidents from allergic teens. www.allergicliving.com: Click on the “Schools” tab on the homepage.